This blog highlights two recent articles that focus on the use of a MicroCal Differential Scanning Calorimetry (DSC) system. The authors (from Sanofi Pasteur in Toronto, Canada), provide a detailed protocol to perform Differential Scanning Calorimetry experiments on an automated DSC, such as a MicroCal VP-Capillary DSC system from Malvern Instruments. This piece is a JoVE article, which incorporates a video, making it easier to visualize the methods used. The focus of the article is characterization of the stability of proteins, such as biopharmaceutical products and vaccines, in an industrial setting. Results from DSC are used to evaluate proteins during formulation development, comparability studies, and other processes in the workflow. The article also discusses data analysis, using Origin software for MicroCal VP-Capillary DSC, and showing data for several proteins and several workflows. 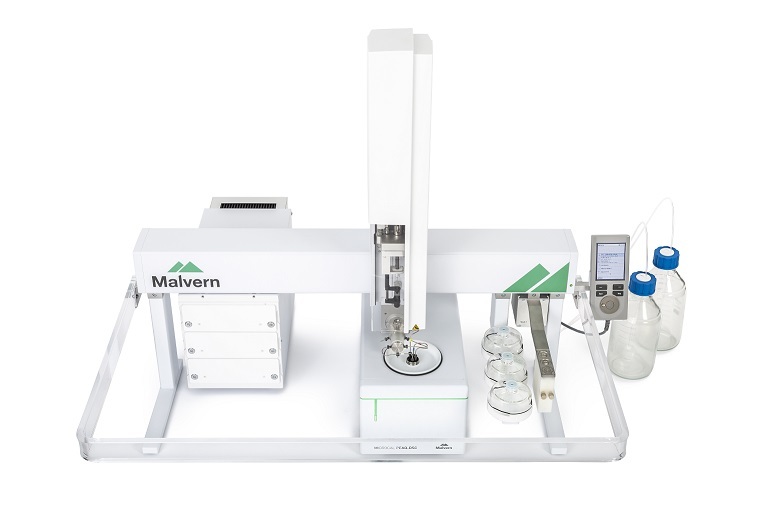 This article was written before Malvern Instruments launched the new MicroCal PEAQ-DSC Automated system, but many of the best practices described in this article also apply to PEAQ-DSC. The new DSC includes optimized software for a multi-user, industrial (and potentially regulated) lab, and workflows designed for biopharmaceutical stability characterization. With the new PEAQ-DSC analysis software, users are able to simultaneously apply the same fitting method and integration baseline to multiple thermograms, minimizing subjectivity and removing inconsistency. Users also can save the fitting method to use for other thermograms in the study, to guarantee consistent fitting methods for all samples, even by different users. Protein scientists are challenged by an incomplete understanding of the energy landscape of protein folding. The ‘minimal frustration’ principle proposes that proteins in the same family, with the same functional ‘fold’, should have similar folding rates, even if the actual amino acid sequences vary. Since related proteins are present in organisms which survive in different environmental temperatures, proteins must also be able to adjust their thermodynamic stability due to differences in unfolding rates. Dr. George Makhatadze’s lab at Rensselaer Polytechnic Institute (RPI) in Troy, NY, tested this hypothesized relationship between unfolding rates and stability by studying fifteen different proteins in the thioredoxin family, including proteins from psychrophilic (optimal growth temperature from 5 °C to 10 °C), mesophilic (optimal growth temperature of ∼37 °C), or thermophilic (optimal growth temperature of >70 °C) organisms, as well as seven resurrected proteins (over 4 billion years old), obtained via ancestral sequence reconstruction. It is believed that the ‘last universal common ancestor’ of the latter group was a thermophilic organism, so these proteins would be expected to be more thermostable than proteins from mesophilic organisms. The scientists used MicroCal VP-DSC to evaluate protein stability (via TM measurements). Protein folding and unfolding rates were determined by equilibrium and stopped flow kinetics. The authors found that all studied proteins folded at similar rates and unfolded at different rates. The unfolding rates also correlated with each protein’s thermodynamic stability from DSC. Additionally, proteins that unfolded at a slower rate were more resistant to proteolysis. This paper provides direct experimental support to the hypothesis of the minimal frustration principle. The authors noted that most other studies relating thermodynamic stability and protein unfolding rates examined protein families from extant organisms, and did not use ancestral proteins. The authors proposed that if it is found that other ancestral resurrected proteins show similar trends in unfolding kinetics, ancestral sequence reconstruction could be used to design and engineer more stable proteins and enzymes today.